Over the past 3 weeks I’ve been working on a new MediaWiki extension that allows creation of on-wiki surveys by admins. It comes with a whole bunch of neat features, and is the most awesome (code wise) extensions I’ve created so far.It’s aptly titled Survey. Surveys get displayed to wiki users using a nice pop-up form. 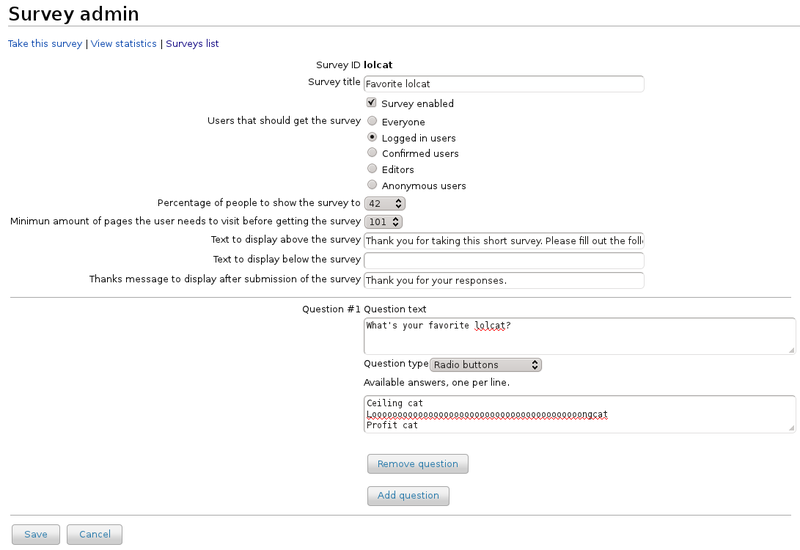 Surveys can be created and modified via an admin panel (Special:Surveys). Surveys can be shown for a specified percentage of users, and only after a certain amount of page views. 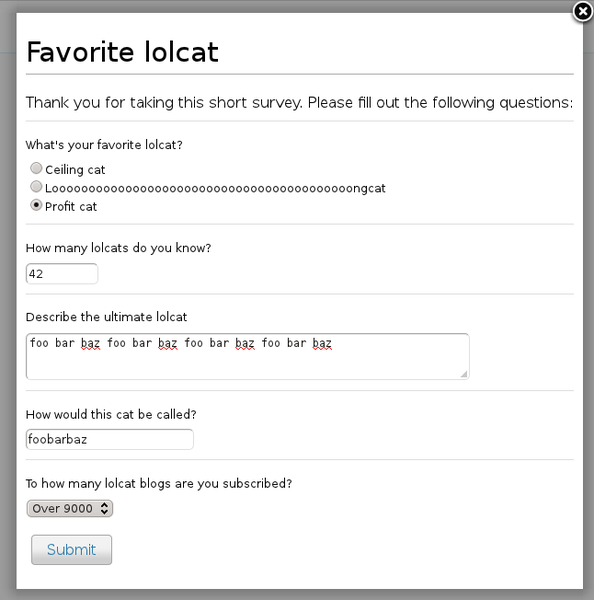 Survey questions can have different types of inputs, of which some allow restricting answers. Surveys can be tested by admins via Special:TakeSurvey without them being live on the wiki. Summaries of survey submissions can be found on Special:SurveyStats. The survey submission data (ie user answers) can be exported via an API. Survey makes use of many new features introduced in MediaWiki 1.17, and therefore requires this version or later. It even makes use of MW 1.18 features, with fallback code for MW 1.17 It also makes use of 5.3 features, these being late static binding and anonymous functions, so it won’t work with PHP 5.2.x and earlier. I developed the Survey extension as WikiWorks consultant for the IEEE, with some help from Yaron Koren.